Blackhall House in Paisley is a 'C' listed building, believed to be the only purpose built silk throwing mill in Scotland. Its owners recently made a successful appeal against a council decision to refuse its application for demolition. The owners, Vinemeadow Ltd. attempted to market the property for rent from around 2007 with no success. Between then and February 2015 when they applied for listing building consent (for demolition) they allowed the condition of the buildings to deteriorate. What that signifies is that council officials took more than 3 months to tell the owners of the councilors' decision !!! That was revealed in an email reply to me by Christopher Kennedy of the Scottish Government (see link above). In June, two months before the council's planning decision (in late August), an incongruous attempt was made to sell the building. It would have made sense before the application or after (for an appeal), but not at that point because if they had been successful, it would have cost them over £1 million. In fact they applied for the demolition order to increase the value of the land. No explanation for this has been forthcoming (from the council, councillors or the Scottish government) . Although the council decision was to refuse the application, it is clear that the government reporter based his appeal decision on the planning department's criteria which was that the financial unviability of a refurbishment sale for the owners backed up by the supposed attempted sale. "27. On balance, planning officials considered that the applicant had satisfied the relevant test in SHEP and the LDP, and had demonstrated that the buildings were beyond viable conversion, refurbishment or re-use. 28. The council’s Planning and Property Policy Board, however, took the view that the condition of the buildings was not such that their retention was not economically viable. " "Evidence of marketing exercises to attract tenant interest and to promote the building for sale (in an attempt to secure an new owner with refurbishment proposals and the necessary funding), failed to attract any tangible interest and none which was pursued by any of the very limited number of respondents. The reasons for this web page are the purely financial criteria on which the decision was based and the anomalous (possibly suspicious) attempted sale of the building. Recent planning history (history of the buildings is at the end). 2. I used my Facebook page to encourage users to object to the application. The council stated that 88 objections were received. Even though they had put in an application for demolition, Vinemeadow tried to sell it for refurbishment in June according to this brochure (pdf). "A closing date is set for 31st of July 2015 and unconditional offers are sought for our client’s heritable interest with vacant possession. Detailed proposals for the refurbishment of the existing buildings and proof of funds are expected at the closing date. Please note that any proposals involving the demolition of the listed buildings will not be considered. " This sign appeared outside showing the building for sale for refurbishment. I mistakenly believed the council had turned down the demolition application and announced it on my Facebook page. What prompted them to put it up for sale for refurbishment in June two months before the council meeting to discuss their own demolition request ? Did council officials advise Vinemeadow to put it up for sale in order to make a case for demolition? Again from the appeal approval. "Option C – Retain only Blackhall House for conversion (23 flats) and new build on remainder of Site 1 and Site 2 (63 units) ...The original analysis of each of these potential scenarios identified Option C as being the least disadvantageous option. It would result in a total loss on the development of £1,201,856." Why would they risk losing at least £1 million on selling it for refurbishment 2 months before their demolition application was considered by the council.? The best time would surely be before the application or after the council's decision to bolster an appeal. 4. Appeal notification to Planning and Environmental Appeals Division (DPEA) of the Scottish Government sent by letter to objectors Dec 7 2015. 5. Inspection notification by letter Jan12 2016. Named individual, Michael Cunliff. 20 July 2012: Building nominated for the Register by local planners. External inspection finds it is disused. There is a broken downpipe to the front which has caused a damp area and loss of paint. Plants are growing in the area and have made footholds at a few other points. A number of 1st floor windows are broken. purchasing the site for refurbishment. James Barr’s extensive mailing list of residential and commercial developers and agents. site, and remains in place. indicated interest in the re-use of the listed buildings. 36. The buildings, and particularly Blackhall House, are a significant part of Paisley’s industrial heritage and of the townscape. Their loss should be avoided if possible. It is regrettable that they have been allowed to fall into a state of serious disrepair, whereby the escalating cost of remediation and re-use exceeds what is economically viable. I am conscious that allowing demolition for redevelopment could appear to be rewarding neglect. However, I am satisfied on the evidence that repair is not economically viable and that reasonable marketing efforts have failed to produce a restoring purchaser. I have to consider what the alternative to demolition would be. It appears to me unlikely that a viable scheme to save the buildings would come forward, and more likely that they would continue to deteriorate to the point where the tower has to be demolished for public safety reasons, or collapses of its own accord. Email to Scottish government case officer Christopher Kennedy. Can you please explain why the reason for appeal was a 'failure to give a decision' ? I don't understand that. Also, do you have any idea why Vinemeadow Ltd put the land up for sale for refurbishment while they had an application for demolition. It would have cost them at least a million pounds. It makes sense before the application or afterwards to support an appeal, but not two months before Renfrewshire Council's decision. In early August I corresponded with council official Elaine Troupe and councillor Lorraine Cameron on the status of the building, but nothing productive came out of it. Could you please tell me the current state of play with regard to Blackhall House. Hi Yes, the officers will still be dealing with the application so there will be a period of time when the documents have all been submitted and are then being reviewed and reports prepared. You will be able to see up-dates for the Planning and Property Policy Board meeting agendas via the Council web site. We don't yet know what applications will be presented at the August meeting. The agenda should be available 3 days before the meeting. Here is the link to the website that shows you the up-coming Planning and Property Policy Boards. Councillor Kelly, seconded by Councillor Murrin, moved that the listed building consent be granted, subject to the conditions and reasons detailed in the report. Councillor J MacLaren, seconded by Councillor Audrey Doig moved as an amendment, that the application be refused for the following reason: "1. The demolition of the listed buildings would be contrary to Scottish Historic Environment Policy and Policy ENV3 and the Built Heritage Supplementary Guidance of the adopted Renfrewshire Local Development Plan. The buildings are of architectural and historic interest; the buildings are not incapable of repair; the demolition is not essential to delivering benefits to economic growth or the wider community; and it has not been demonstrated that the repair of the buildings is not economically viable. 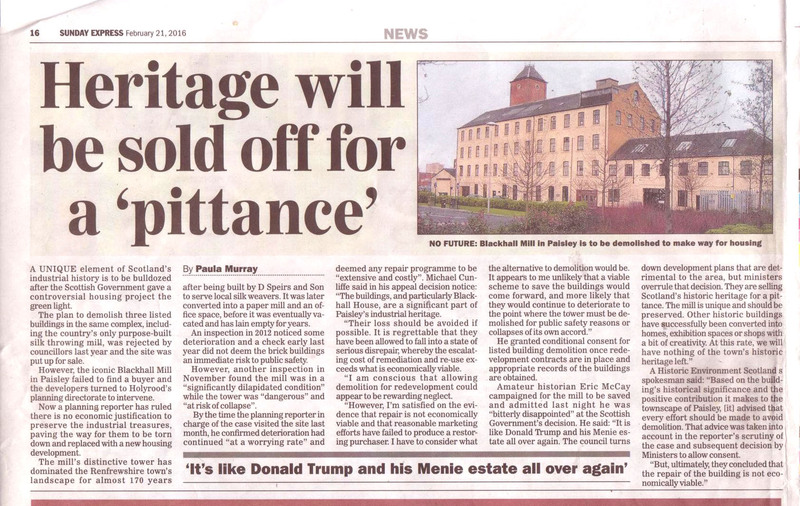 Their demolition would therefore be detrimental to the architectural and historic interest of the buildings and to Paisley's heritage." On the roll being called, the following members voted for the amendment: Councillors Audrey Doig, Gilmour, Hood, J MacLaren, McGee, McGurk, Nicolson, Perrie and M Sharkey. The following members voted for the motion: Councillors E Devine, Grady, Kelly and Murrin. 9 members having voted for the amendment and 4 members having voted for the motion, the amendment was accordingly declared carried. This mill may well be the only purpose built silk throwing mill in Scotland, and was built for D Speirs and Son in around 1848 (Hume). The term `throwing' can describe a particular part of the silk making process, that of giving the twist to the yarns, or can mean the entire process of turning raw silk into threads. 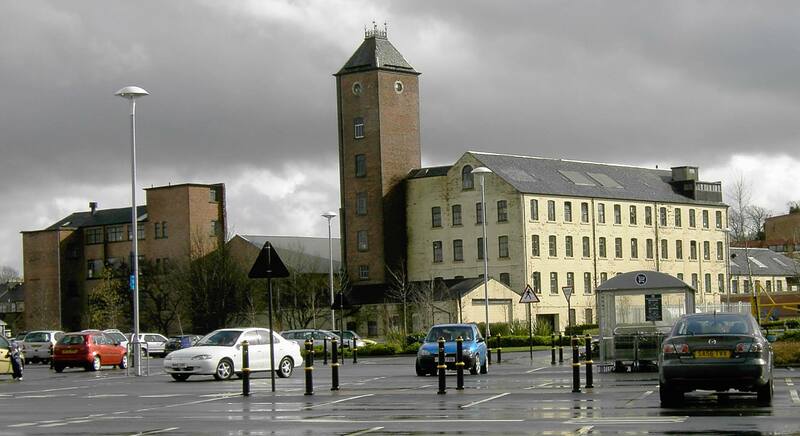 Paisley had an international reputation for its textiles and although silk production was never on the scale of the more famous cotton (such as at the nearby Anchor Mills). This building is important evidence of Paisley´s industrial past. The decline of the silk industry is demonstrated by the fact that this factory was converted into a paper mill by the end of the 19th century (see 2nd Edition OS map), when it is likely that the silk throwing firm went out of business. The Beginning - Coats Ltd. In the 1750s, two young brothers called James and Patrick Clark moved to Paisley to begin work in the weaving trade. At the time, Paisley weavers were reproducing the rare Kashmir shawls of India at greatly reduced prices – but silk was necessary for this process. In 1803, Britain went to war with France and their leader, Napoléon blockaded the British Isles. This prevented many supplies from being imported – including silk. It was the silk shortage that caused the Clark brothers to create a method of twisting cotton yarns together. This produced a thread as smooth and strong as silk that could be used by the Paisley weavers. Soon it was discovered that it was strong enough to replace linen and silk thread for hand sewing. So in 1812, the two brothers placed their first cotton sewing thread on the market to meet the demand. They opened their first mill in 1817 and shortly after discovered a way to spool thread onto wooden reels.